If you have got the money you would like to invest it in order to make a profit. One of the best ways of investing money is that you buy property with it. Now that property may not be a necessity for you currently but it might be helpful in future. Let’s say you need money for some reason in the near future, now at that time, this property would help you as you can sell it to fulfill your need for money. Apart from helping in future, investing in property or any other values can help you in your present too. There are people out there who might be in need of that specific item let’s say a vehicle but either they need it for a short time duration or cannot afford to buy it completely. There is a simple way by which you can help them and get profit in return. You can lend your vehicle for a specific time period and the person whom you are lending will pay you to rent in return for using it. 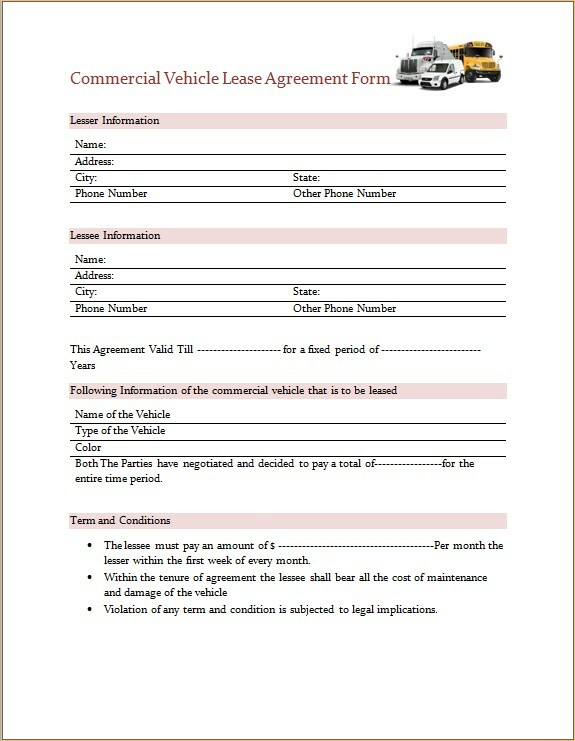 For renting commercial vehicles you always need to fill lease agreement form for legalizing the deal. It should be noted here that the form is required to have all the details about the deal and it should be signed by both the parties as a gesture that both of the parties agree to the terms and conditions. This legalization would save you from any kind of future conflict. Construction of this agreement from scratch would require a lot of research about the template and the guidelines most commonly followed. This will indeed be a tiring procedure which will not only consume your energy but your time too. We have a simple solution for this issue. We here provide you with different templates that are designed by following all the rules and regulations. Thus all you need to do is to download one of these templates, add your required information in it and hurrah! You will be having all the desired legal coverage within minutes.